Q. The only Brit left in the men's singles. With Murray not being here, do you feel like you have more lenses on you, tension? KYLE EDMUND: Just in general, probably the last you could say six months, with the Australian Open run, that probably helps. But, yeah, I felt a little bit more attention. Regardless of how many Brits are there or if Andy is around, there's probably been a bit more attention. I've had heaps more off-court stuff to do, from my point of view anyway. Tough to say if it was because of Andy not being here or other Brits. I've just had that in general, so... Yeah, I mean, it's just all part and parcel of professional sport, going up the rankings that that happens. Q. How pleased were you with your performance and time to get home for football? KYLE EDMUND: Yeah, the performance was good. You always want to do well at Wimbledon. There's that buildup period where there's always talking about it, how you're feeling, are you confident. You get asked those questions. It's just about going there and wanting to do well. When the time comes, it's about producing. I thought today was a great experience for me being out on No. 1 court. To be on the court and playing is a great situation, a great feeling, especially when you win. I felt, yeah, I did a pretty good job. Like you say, I don't know if they did it intentionally, but all the organizers put the Brits on first up on the schedule in time to watch the football later, which is great. Q. Are you recognized more on the street? Is that something that you embrace, that you've noticed more and more now? KYLE EDMUND: It does happen a little bit more. I mean, it's not like I'm a big deal or anything like that. A few more selfies, autographs, especially around this time of year, around the grass court season. I mean, it's a good thing. I was, I guess, still am, if I see someone that I like to look at on TV, in sport and stuff, I always want to have a chat to them, take a picture. For sure, tennis fans want the opportunity to have a selfie or autograph, whatever it is, which is great. It's only a little bit more. It's not like it's crazy or anything. Q. Who is the last person you had a selfie done with? 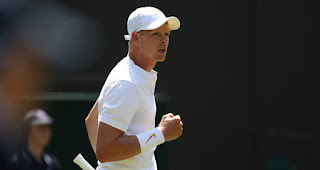 KYLE EDMUND: Who was it? I don't know. There's always fans around. Q. For you when you picked someone? KYLE EDMUND: Yeah, whenever I get the opportunity. I mean, it's tough to actually know. If I go and watch a Liverpool match, I get the opportunity to take one with a Liverpool player, for sure. Obviously I'm a huge fan of like motorsports. I haven't been to too many to have selfies. Basically, I mean, I'm still a fan and know what it feels like to have the opportunity to have with someone you look up to. I know it's always good to put the time in with someone. Q. The grass has not always been kind to you here. When you serve at 131 miles an hour, as you did today, is there any reason why you can't prosper on lawn, grass courts? KYLE EDMUND: Well, there's no reason why, you know, you can't win matches and stuff, for sure. That's how I try to view this year, or any tournament. I know I have a good game and always try and believe in it, be confident with it. Like you say, when you have a big game or a big serve, you got to use that to your advantage, especially on a grass court. When you have big serves, it helps. There is no reason why. It's all down to producing on the day. I find a lot of matches are won and lost at this level in the head, who makes the right decisions on the day. Q. I know you wouldn't discuss opponents with Andy or strategy, all that kind of stuff. I'm wondering if around here, before he left on Sunday, your paths had crossed, he said good luck or anything like that? KYLE EDMUND: Yeah, no, we didn't actually see each other for whatever reason. Just different schedules. Our lockers are actually next to each other in the changing rooms. But I actually never saw him. It was just one of those things. Last time we pretty much saw each other was in Eastbourne after the match. Yeah, it's just the way it works out, I guess. I mean, I was here on the Saturday. I think he pulled out on the Sunday, I think. It was only a couple of days we had the opportunity. I didn't actually see him, unfortunately. Q. The lockers adjacent to each other, is that a coincidence, alphabetical? E and M are not that close. KYLE EDMUND: I'm guessing he's had his lockers there since he's played. My first year in the main lockers was last year. I don't know if I actually picked it or the locker room attendants picked it. But I had the same lockers this year, I had last year for this year. They just remember and put -- I think because Andy is a full member, he obviously keeps his lockers throughout the full year. That's what full members get. Because I'm still a temp, I don't keep a locker, I get it for the tournament. I think they remember from last year and put us together again. Q. I know you were, not sure if you still are, are working with Mark Hilton. What did he bring to your team, to your game, over the last year? KYLE EDMUND: Yeah, I mean, after the summer last year, I obviously split with Ryan Jones. I asked him to travel with me to America to cover those. It was a long trip, about seven weeks. That wasn't, like, a permanent thing. I asked him if he could do a trip, because I knew him very well from juniors. I was really happy with the way we got on from a personal point of view. That sort of chemistry, you could say friendship, but I was also very sort of happy with what he brought to the game in terms of when there was always not tough conversations, but we needed to talk about what I needed to improve on, he was always straight to the point, very much like, This is what needs to get better. That's what I really liked about him. It wasn't sort of generality in what he was saying. It was like, Now, this needs to be better, or, You're doing this very well. That's what I liked. It was ultimately that trip. I knew him before, but that trip helped me in terms of coming to an idea of what I wanted in terms of a coaching team. Then, of course, Fredrik came in. Q. There were some pictures floating around of empty water bottles across the court. Is that something you've noticed? Is there a lack of bins out there? There was actually a sketch at Monte-Carlo, a player party thing. That was one of the sketches they did. They came on and had a hit, then they threw out their water bottles and a banana skin. Someone else came on and tripped over the banana skin. I think, yeah, it's no good, really? We're professional tennis players, we should obviously look after our rubbish. Always try to do the best I can to clean up after myself. It's just human beings being lazy, knowing that someone else will come pick it up. Yeah, I mean, I don't know. I haven't lost any sleep over it, but it's probably best to obviously clean up after ourselves. Q. Not showing the football here later as part of the policy. Is this something you agree with? Something you'd like to see changed? KYLE EDMUND: I don't know really. It's a tennis tournament. They're here to watch tennis anyway. Myself, like I said, it's great I was first on. I'm going to go back to my place and get some treatment and watch the football there. Yeah, pump for the team. I think the way the World Cup has worked out, it's pretty, like, indecisive. It's tough to really gauge what's going to happen. I think that helps England, to be honest. It's there for the taking. Yeah, this is what you want, knock-out stage of the World Cup. You stay or go home. Hopefully the boys can get it done, like I said, do the nation proud. Yeah, I'm really pumped to support. Q. Have you played on No. 1 court before in juniors? KYLE EDMUND: Yeah, doubles, semis. Q. The next step now the last remaining court, Centre? KYLE EDMUND: It's all right (smiling).